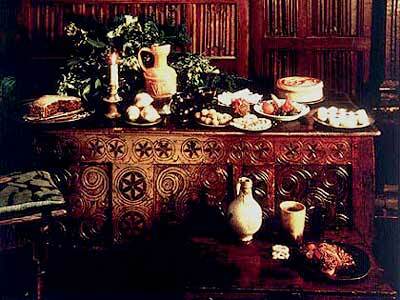 Christmas in Queen Elizabeth I’s day was a time of feasting and revelry, much like today. Naturally the rich celebrated the event to excess and the poor made do with what they had. It’s not easy to find accounts of what the average person did all those hundreds of years ago, so I’m going to tell you a little bit about how the well-off put the silly into “silly season”. When the Elizabeth inherited the throne, she was a breath of fresh air. The previous monarch, her half-sister Queen Mary, was dour and bitter, her legacy one of bloodshed and persecution. Elizabeth was young and vibrant by comparison, and she set out to be different to Mary from the start. Suddenly Christmas became a celebration again. Elizabeth usually partied at Greenwich Palace, one of her favourite palaces, from December 24th through to January 6th (Twelfth Night). Festivities involved feasting on roasted pork, beef, goose and other meats (they loved their meat back then), mince pies and plum porridge. Yum! They danced, played music, watched plays, sang carols and gambled. The palace was decorated with ivy, holly and other greenery from the garden. It must have been a wonderful mid-winter event, not too dissimilar to today. I bet Lizzy even had an old uncle or two who fell asleep after the midday feast and annoyed the other guests with his snoring.